Nearing the end of the 2nd Inning in today's $100 Changeup and the players are taking their positions in the field. 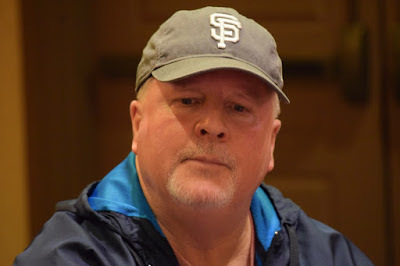 Already in the lineup is Event 1 champ Chris @RUKidingMe44 Hinchcliffe, Event 3 runner-up Matt @PokerNews916 Boddorf, Jose Esparza, Lala Thomson, Dennis Carlson, Greg Kelly and Mickey Friend. Registration and unlimited re-entries is available until 1:15pm, the start of Level 7. At least 12 players cash in this format, there's a $5,000 Guarantee. Play 9-handed until down to 24 players after registration closes. Redraw to four 6-max tables and play a Shootout format, Winner Take All at each table. The four Shootout winners play Heads-up for the final four payouts.